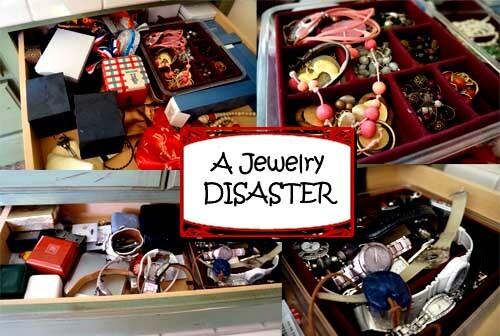 I don’t wear much jewelry but I do own quite a bit. Part of the reason I don’t wear it much is because I often forget what I have. In the past I kept everything in two small drawers in my bathroom until my Mom gave me this great jewelry hanger for my closet. My closet has horrible lighting for taking pictures! 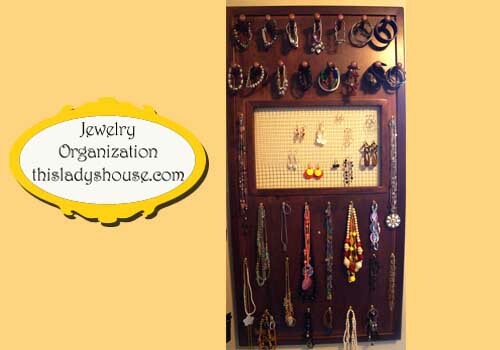 This jewelry board is 24″ wide and about 48″ tall. It has 14 large pegs for watches and bracelets, a wire screen for earrings, and 22 small hoooks for necklaces (each hook will hold multiple necklaces). Before I moved my jewelry into the closet my husband was hanging his hats on the large pegs… maybe I need another row of pegs! Now I can see what jewelry I have while I am getting dressed, hopefully this will remind me to wear it more often. Now if only I had a personal stylist to tell me what looks best…. I’ve never been good at dressing fashionably! This entry was posted in Mission Organization and tagged Organization.